Barton, a prosecutor with the Washington County District Attorney's Office, will take office in 2019. The most expensive district attorney's race in state history appears to be over. Sherwood resident Kevin Barton is leading the race to be named Washington County's district attorney against candidate Max Wall. Barton, the chief deputy district attorney in the Washington County Circuit Court in Hillsboro, holds 68.5 percent of the vote, based on results available as of Wednesday morning, May 16, the day after the election. Wall notched 31.2 percent. "To me it felt like waiting for a jury to come back with a verdict," Barton said after the results were released Tuesday night, May 15, showing him almost 40 percentage points ahead of Wall. "I knew I had done everything possible. But instead of a jury of 12 it was a jury of 300,000 of my peers." Barton said the decisive victory sends a message that voters are happy with the way the county is heading. "I believe in speaking honestly and truthfully about what I believe to be true and what I believe to be right," he said. "I'm honored and humbled that they trust me to be the leader to do that." Barton has spent a decade in the DA's office under longtime district attorney Bob Hermann. Wall is a Beaverton defense attorney who spent eight years in Polk County as a prosecutor. The race is the first contested district attorney election in the county in decades and the most expensive district attorney's race in Oregon history. Tuesday's election drew a considerable amount of media attention because of high profile donors who have endorsed each of the two candidates. Barton, the county's chief deputy district attorney, has led a charge to form a digital forensics lab to work with law enforcement, and helped launch a veteran's court this year. He has said he'd like the department to do more outreach with the public to better understand what goes on in the county's courthouse and the responsibilities of a district attorney. Wall has pointed to black marks in the agency's recent history, including District Attorney Bob Hermann's decision to allow a police officer convicted of beating his son to change his conviction to a lesser crime so he could continue carrying a gun while on duty, a decision which Barton fought against, according to The Oregonian. In a concession speech on Tuesday night, Wall said he entered the race to start a debate about criminal justice reform. "Our campaign created real public discussion on alternative sentencing, dealing with our overcrowded jail, and ensuring prosecutors have a smart and fair approach to criminal justice," he said. "I wish District Attorney-elect Kevin Barton the best as he approaches the challenges ahead." District attorney's races are seldom seen as major elections, but in the past few years a wave of reform-minded candidates have swept into office across the country, partly backed by liberal billionaires working to fund their campaigns. Barton has pushed Wall hard on his campaign financing, claiming for months that Wall has been funded by George Soros, a New York billionaire and political activist who backed several reform-minded candidates across the country in 2016. The vast majority of Wall's sizeable war chest has been donated by the Oregon Law & Justice PAC, a local organization with ties to Soros. That committee has contributed roughly 86 percent of Wall's $450,000 campaign. Wall has denied accusations from Barton that his campaign was being influenced by outside interests, and has said that contributions from PAC associated with Soros show a desire to change Washington County's culture of throwing the book at suspected criminals. 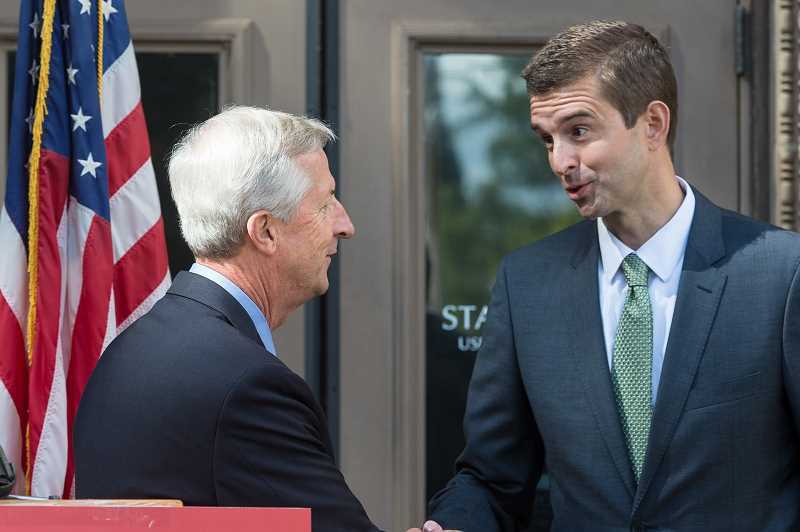 Wall far out-raised Barton in the race, who has amassed more than $250,000 in campaign contributions, including $100,000 from Nike co-founder Phil Knight and more than $59,000 from conservative political action committee ActionPAC. As the chief prosecutor in Washington County, the district attorney oversees a staff of more than 40 prosecutors and handles some of the county's most high-profile cases. Editor's note: This story has been updated with unofficial election results as of Wednesday, May 16.